What is the cheapest way to get from Carlton Hotel, Sliema to Malta Airport (MLA)? The cheapest way to get from Carlton Hotel, Sliema to Malta Airport (MLA) is to drive which costs 1€ - 2€ and takes 11m. What is the fastest way to get from Carlton Hotel, Sliema to Malta Airport (MLA)? The quickest way to get from Carlton Hotel, Sliema to Malta Airport (MLA) is to drive which costs 1€ - 2€ and takes 11m. Is there a direct bus between Carlton Hotel, Sliema and Malta Airport (MLA)? Yes, there is a direct bus departing from Sliema and arriving at Malta Airport. Services depart hourly, and operate every day. The journey takes approximately 24m. How far is it from Carlton Hotel, Sliema to Malta Airport (MLA)? The distance between Carlton Hotel, Sliema and Malta Airport (MLA) is 7 km. The road distance is 10.6 km. How do I travel from Carlton Hotel, Sliema to Malta Airport (MLA) without a car? The best way to get from Carlton Hotel, Sliema to Malta Airport (MLA) without a car is to bus which takes 34m and costs 6€ - 8€. How long does it take to get from Carlton Hotel, Sliema to Malta Airport (MLA)? 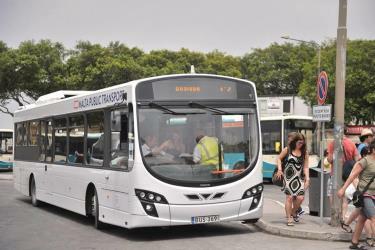 The bus from Sliema to Malta Airport takes 24m including transfers and departs hourly. Where do I catch the Carlton Hotel, Sliema to Malta Airport (MLA) bus from? Carlton Hotel, Sliema to Malta Airport (MLA) bus services, operated by TerraVision MT, depart from Sliema station. Where does the Carlton Hotel, Sliema to Malta Airport (MLA) bus arrive? 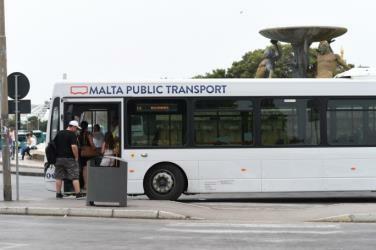 Carlton Hotel, Sliema to Malta Airport (MLA) bus services, operated by TerraVision MT, arrive at Malta Airport station. Can I drive from Carlton Hotel, Sliema to Malta Airport (MLA)? Yes, the driving distance between Carlton Hotel, Sliema to Malta Airport (MLA) is 11 km. It takes approximately 11m to drive from Carlton Hotel, Sliema to Malta Airport (MLA). Where can I stay near Malta Airport (MLA)? There are 1891+ hotels available in Malta Airport (MLA). Prices start at 50€ per night. What companies run services between Carlton Hotel, Sliema, Malta and Malta Airport (MLA), Malta? TerraVision MT operates a bus from Carlton Hotel, Sliema to Malta Airport (MLA) on demand. Tickets cost 6€ - 8€ and the journey takes 24m. Rome2rio's Travel Guide series provide vital information for the global traveller. Read our range of informative guides on popular transport routes and companies - including Getting to Rome from the airport, Heading to Europe? Read this before you buy a Eurail Pass and Need to know: Eurostar - to help you get the most out of your next trip. The Valletta Waterfront, is a promenade in Floriana, Malta, mainly featuring three prominent buildings; a church in the middle, the Pinto Stores or the Pinto Wharf on the left, and the Forni Stores or the Forni Shopping Complex on the right. The buildings were originally stores and warehouses, built in the 18th century, and the design is attributed to Andrea Belli. The area is now a hub in Malta's cruise liner business as the Forni Cruise Passenger Terminal, and hosts a concentration of bars, retail outlets and restaurants. The area was and remains a venue for several concerts and events. Mnajdra (Maltese: L-Imnajdra) is a megalithic temple complex found on the southern coast of the Mediterranean island of Malta. Mnajdra is approximately 500 metres from the Ħaġar Qim megalithic complex. Mnajdra was built around the fourth millennium BCE; the Megalithic Temples of Malta are among the most ancient religious sites on Earth, described by the World Heritage Sites committee as "unique architectural masterpieces." In 1992 UNESCO recognized the Mnajdra complex and four other Maltese megalithic structures as UNESCO World Heritage Sites. In 2009 work was completed on a protective tent. Rinella Battery (Maltese: Batterija ta' Rinella) is a Victorian battery in Kalkara, Malta. It is commonly referred to as Fort Rinella (Maltese: Forti Rinella), although it was never classified as a fort while in use. It contains one of two surviving Armstrong 100-ton guns. The Saluting Battery (Maltese: Batterija tas-Salut) is an artillery battery in Valletta, Malta. It was constructed in the 16th century by the Order of Saint John, on or near the site of an Ottoman battery from the Great Siege of Malta. The battery forms the lower tier of St. Peter & Paul Bastion of the Valletta Land Front, located below the Upper Barrakka Gardens and overlooking Fort St. Angelo and the rest of the Grand Harbour. Rome2rio makes travelling from Carlton Hotel, Sliema to Malta Airport (MLA) easy. Rome2rio is a door-to-door travel information and booking engine, helping you get to and from any location in the world. Find all the transport options for your trip from Carlton Hotel, Sliema to Malta Airport (MLA) right here. Rome2rio displays up to date schedules, route maps, journey times and estimated fares from relevant transport operators, ensuring you can make an informed decision about which option will suit you best. Rome2rio also offers online bookings for selected operators, making reservations easy and straightforward. Need an airport transfer to Malta Airport?